A movie and a few good friends, a late supper. Not bad, right? We'll start with a family favorite, a Wild Mushroom Soup. Comforting, rich, delicious. Rinse the dried mushroom in a strainer under cool water, and put them in a small bowl with the madeira for about an hour, stirring occasionally. Melt the butter in a stew pot, and cook the onions until they are a bit soft. Wipe the mushrooms with a damp towel and chop them coarsely, add to the onions in the pot, toss in the thyme, add salt and pepper to taste, and cook uncovered about 10 minutes. Lift the dried mushrooms out of the madeira, and add them to the pot. Let the madeira settle, and pour the soaking liquid into the soup pot, leaving any debris behind. Discard debris. Add stock, and simmer, covered for about 45 minutes, until the dried mushrooms are tender. 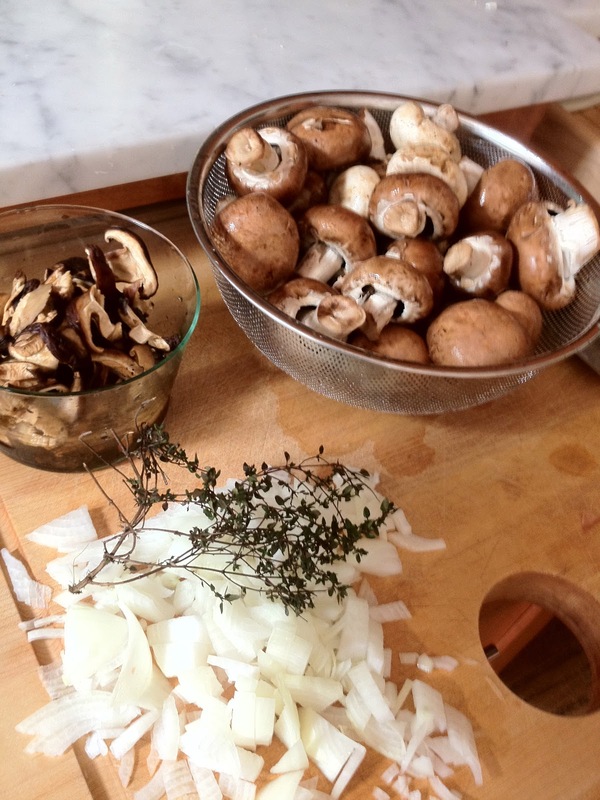 Strain the soup, and transfer the mushroom solids to a blender or food processor with about a cup of the broth, blend till very smooth, and return puree to the soup pot. Add salt and pepper, and truffle salt to taste. Thin the soup with the cream if it seems too thick, or you want it to be super creamy. Heat and serve immediately. 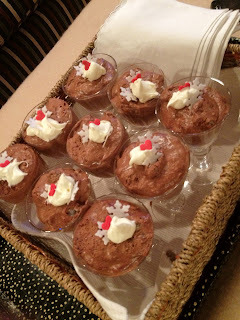 This Chocolate Mousse Recipe was a standby when I was a newlywed. The recipe was my mother's and properly could be filed under "great recipes of the 80s." If you make it in a big bowl, it will have to chill for at least 8 hours, but putting it into small bowls, or aperitif glasses, it will set in about four hours. 1-2 Tablespoons brandy if desired. Put chocolate in food processor and pulverize. Heat half and half till boiling point (microwave, or stovetop), and with processor running, add to pulverized chocolate and blend 10 seconds, mix in egg yolks. Beat 1 cup heavy cream until stiff. Spoon mixture into a glass bowl, or individual bowls or glasses. Refrigerate 4 hours for individual servings or overnight for a large bowl. Garnish with more whipped cream and chocolate curls if you like.